Forbes has published an updated list on Major League Baseball franchise valuations, "The Business of Baseball." As a business operation, the Philadelphia Phillies are doing quite well. In fact, the team has the highest operating income (aka profit) in baseball. 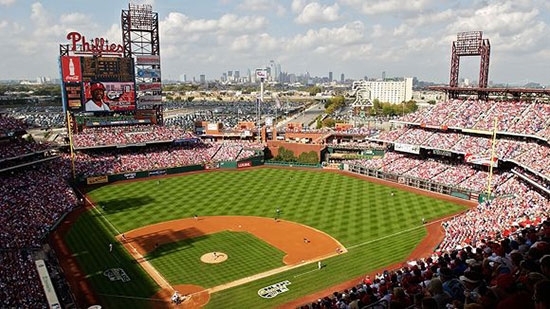 Last year the Phils had $325 million in revenue with $87.7 million in operating income. The World Series Champion Chicago Cubs were second on the list with $83.8 million. The franchise is also the #9 most valuable on the list, currently worth $1.65 billion, up 34% from last year. All that extra money could end up in the pockets of talented free agents when the time comes. So who's last? The Tampa Bay Rays are only valued at $825,000. The Detroit Tigers had a operating income of -$36.4 million, meaning they lost money. A Montgomery County man is under arrest after attacking his estranged wife and her new boyfriend inside her Hatfield home. Jason Beck broke into his estranged wife's home and hid in her closet for six hours on Monday. He waited for her and her boyfriend to come home and then go to bed. When the lights were out, he jumped out of the closet and pepper sprayed the two. He then beat the man with a baseball bat and stabbed him. He also assaulted the women. He ran out of the house and was caught by police. Beck had been served with a restraining order on Friday. Three children were asleep in the house at the time. He is charged with Aggravated Assault, Burglary, Criminal Trespass and other charges. He remains in prison on $500,000 cash bail. A Chester County woman has pled guilty to third-degree murder in the beating death of her 3-year-old son. 33-year-old Jillian Tait also pled guilty to conspiracy to commit first-degree murder and child endangerment. She will be spared the death penalty and testify against 25-year-old Gary Lee Fellenbaum III. 3-year-old Scotty McMillan was hung up and beaten repeatedly with objects until he eventually died in November 2014.